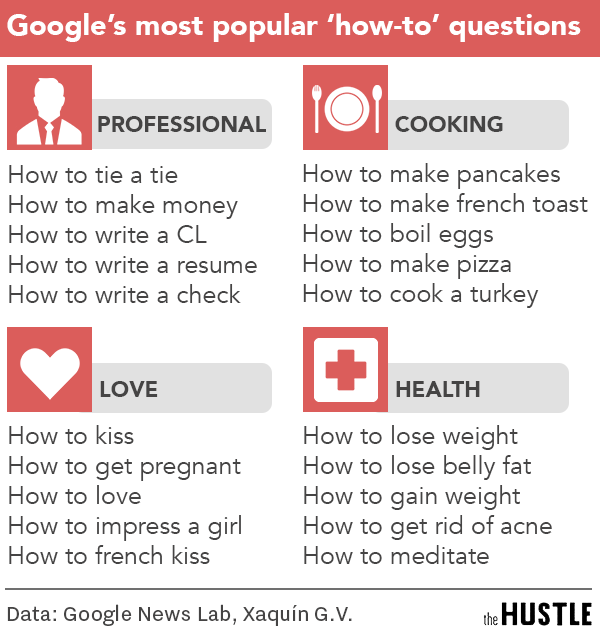 What are Google’s most popular “how to” searches? Last year’s have just been released, in a fascinating new site from Google News Lab. It’s no surprise – people still don’t know how to tie a tie. Or boil an egg. And the age-old dilemma of how to kiss is still top of mind for many. Still, as silly as these Google searches seem, they represent a huge opportunity. When you’re blogging and posting, particularly on video, consider how you can solve these problems. A quick You Tube video about making pancakes, writing a check or impressing a girl can be just what your target audience is searching for, literally, and just the thing to raise your online profile. So before you spend your time creating content, spend some time understanding what your audience really wants to know.